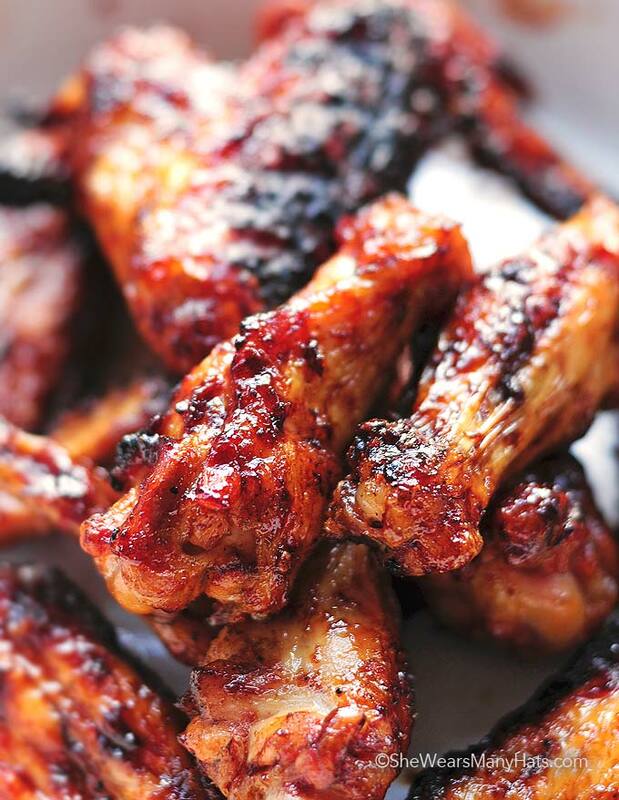 A super sweet, spicy and simple Sweet Spicy Grilled Chicken Wings recipe. This recipe is short and sweet, and a little spicy too. Sweet and Spicy Grilled Chicken Wings have become a regular weeknight meal for us, usually every Monday, our BBC Top Gear Family TV Night. The wings are quick and perfect with a side of sweet potato fries, and seasoned beans of some sort. Plus they’re grilled. Which means a bit lighter, with no greasy, frying mess to clean up. If you’re familiar with grilling, this recipe is as simple as it gets. (Of course there are alternate instructions for baking them in the recipe below.) We use a charcoal grill with these over a low, even heat, and for better control over flame. My husband is the grill master in our home and prefers charcoal over gas when time permits. Nothing beats an old kettle charcoal grill. Other than grill skills, the sweet and spicy sauce is made with equal parts of balsamic vinegar, honey, and hot sauce. For the hot sauce, we usually use sriracha hot chili sauce (the one with the rooster on the bottle), but any of your favorite hot sauces will do. We use this sauce for other cuts of chicken too. It’s a nice balance of sweet and spicy for us, but if you can kick it up a notch or two if you like it hot. Try this one soon, y’all! 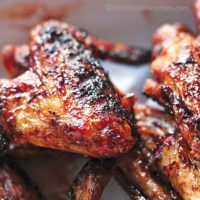 I think you will find these Sweet and Spicy Grilled Chicken Wings become a favorite regular in your home too. Whisk up some sauce, light the grill, and get those paper towels ready! Happy cooking! 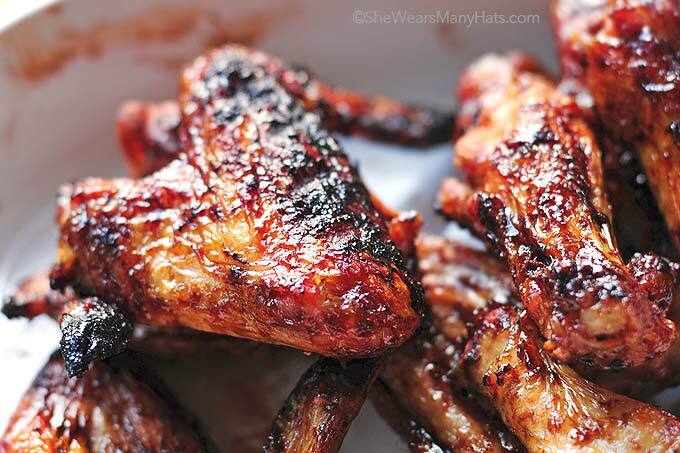 This lighter wing option is so easy and super delicious to prepare. Perfect for game-time grub! Whisk together first three ingredients. Set aside. Place wings on grill over low, direct heat. Grill 15 minutes per side, then baste chicken with sauce, turn, and continue to baste until done, and desired crispness, color, coverage is reached. * Substitute your favorite cut of chicken. Thighs and legs are fabulous!To bake in oven: Preheat oven to 350-degrees F. Place wings on baking sheet (line with aluminum foil for easy cleanup). Cook for 15 minutes, then baste wings with sauce, turn over, baste. Continue to cook and baste until done, checking every 15 minutes or so. Originally published May 15, 2012. Oh my hubby will love you for this….he loves his wings!! What an easy, simple sauce you’ve created. I was just recently introduced to the sriracha sauce by our nephew. Can’t believe I’d never heard of it before. I think this sauce would work on just about any meat. Ribs (of course w/o the bone for you), pork tenderloin … all would be yummy! I love how simple this looks! Mmmmm! Dear Lord those look so GOOD. These look amazing, Amy. Your photographs always just make me sigh at the simple beauty you capture in every single one. I seriously need you to sit atop my shoulder coaching me all the way. How about you cook, and I’ll help you in between nibbles? Deal? Sounds like the perfect deal to me. Amy, this looks seriously yummy! My kids would go nuts over these little beauties. This looks so good!! I love sriracha hot sauce! Loving your honey recipes and this is one the boys would go crazy for! My hubby loves his wings too, the spicier the better. I bet he’ll love this sauce! Love that combination of sweet, tart, and spicy! We’ll be trying your version real soon. I’m going to need a few extra napkins. Want. Oh my! Chicken wings is my most favorite part of chicken. I can see it now. 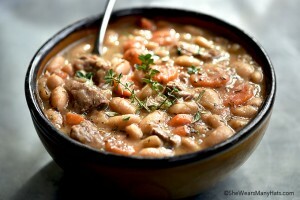 This will be a weeknight meal for us as well for many weeks to come. I’ve baked and fried chicken wings but I have yet to grill them. The boyfriend and I are thinking about investing in an electric grill soon so this will definitely be on our “to-grill” list this summer! I love chicken wings and these look AMAZING! Will definitely make these for dinner tonight! I know a man in my house that will go crazy for these! Ooh nice way to kick off the season! Love chicken wings and love this sweet and spicy version! Now only thing left is to clean the grill! My husband would love these! He happens to be the grill master in our house too and I don’t think he would have any problem grilling up some of these babies. This sounds perfect! I’m a bit jealous of your grilling options. I love charcoal grills, they smell amazing! This is my kind of sauce. These look so perfect Amy. I love our charcoal grill!!! Oh my heavens! My lips are smacking and my fingers are twitching. Girl you’re killing me with the crispy deliciousness up there. I truly started salivating as soon as I saw that top photo. These wings have all the flavors I love the most, and I can imagine that the flavors are deepened with a little turn on the grill. oh yes, bring on the sriracha! These look delicious. We love grilled wings and will definitely be giving these a try in the very near future. 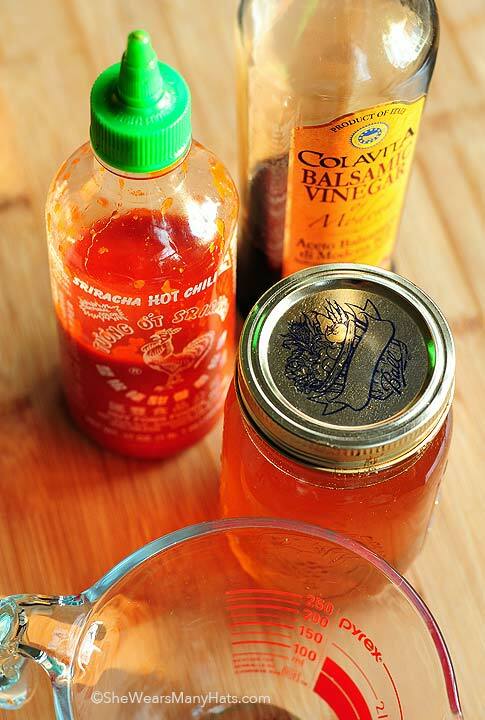 Plus, anything with Sriracha has to be amazing – it’s a staple condiment in our house. Try mixing it with blue cheese dressing! Amazing. I am not even really a chicken wing fan but these look great. Not too much sauce, just enough! Love how easy these are! My husband and kids love Top Gear…so funny! Oh my goodness, these are fabulous. They are just tempting me to whip some up right now. Oh thank you so much Rachel! That sauce combo is on our menu weekly (sometimes twice). I hope y’all enjoy your 4th. AND keep cool, man. On my way to the store for chicken wings! These look delicious! This sounds too good to be true! how simple is that? will definitely give it a try! Congrats on your Buzzfeed shoutout! I was wondering if the sauce could work well with baked wings? I don’t have a grill. If so should I toss them in the sauce before baking, afterwards, or maybe half and half? Thanks! I tried these today and oh man, they are AMAZING! Even my picky eater wife loved them 🙂 Wonderful spice without the intense heat. So glad to hear it Matt! Our picky eater teenage son has already learned how to make them himself. Such a great go-to! My husband yelled, “BEST WINGS EVER!” And he doesn’t even like wings. I left out the hot sauce (except for a tad) for my duaghter who also loved the. I loved them too! THANKS! This was sooooooo Good!!! I tripled the recipe bc we like our wings really wet (that way we can use some of the sauce on our fries lol). I ran out of honey by about an 1/8th of a cup and just substituted with a little brown pepper. Seriously yummy!! You definitely could! I’d bake at 350°F for about 30 minutes then check for doneness. Yum! Always looking for wing recipes. We love them too. Gonna do this for our Super Bowl snacks! Thanks! These sound great! I was planning on frying the wings and hen tossing them in the sauce. Wonder if that will still work? Can I subsitute the balsamic vinegar with apple cidar/red wine vinegar? does it matter what kind of honey you use? No. Any type will do! How many wings is 4lbs? Attempting to make about 75 wings and am unsure of how much of the marinade I need to make. I’m not sure as I haven’t cooked this in a crockpot before. These look great. You say low heat – how low? 325? 250? Hehe… We love them too. Gonna do this for our Super Bowl snacks! Thanks shewears! This recipe is so simple but looks fantastic! Thank you for sharing! Absolutely phenomenal! My hubby and I are self proclaimed wing connoisseur,lol. These were Simply scrumptious! Thanks so much for the share! Will DEFINITELY make again! ??????? ?